Youth jail opponents meet state troopers, city police and a SWAT team on Martin Luther King’s birthday. 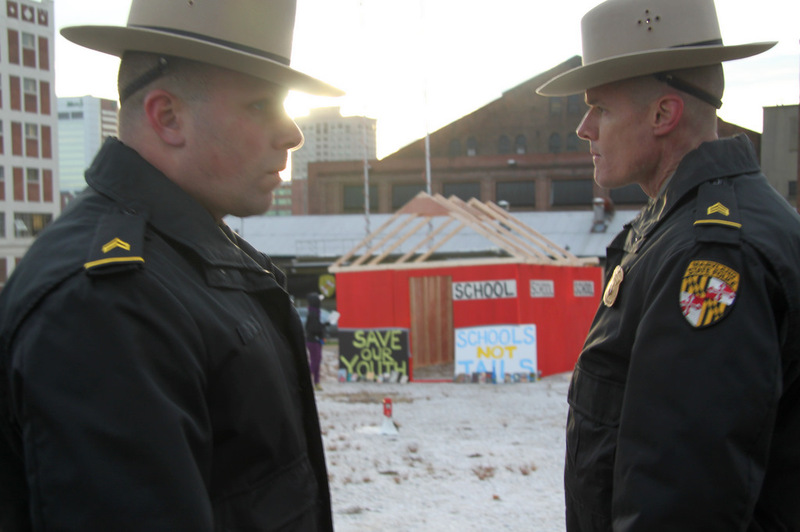 Above: State Troopers at site of a planned youth jail in Baltimore, hours before government crews tore down the symbolic “schoolhouse” that protesters built. 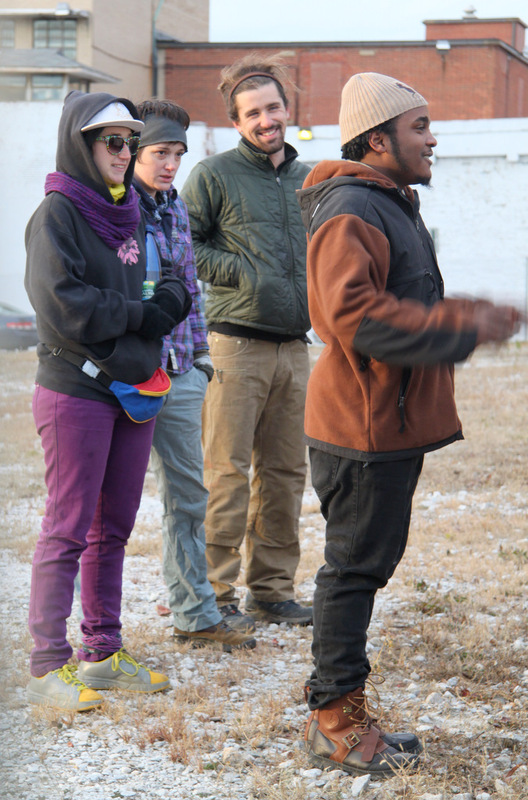 There seemed to be two “enemies of the state” yesterday at the Occupy Baltimore protest against a planned juvenile detention center in East Baltimore. One was the 75 protesters themselves, who were met by dozens of Maryland State Police, Baltimore City Police and SWAT team members in riot gear, armed with guns and batons. 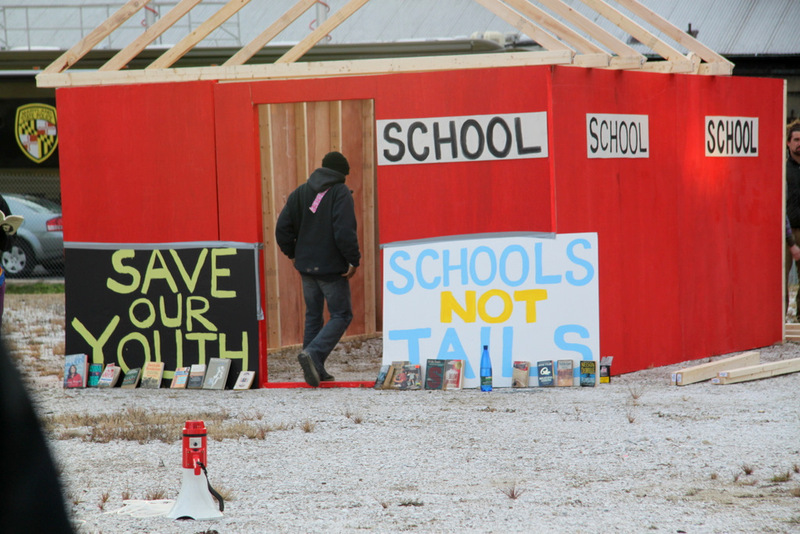 They eventually arrested six of the “Schools not Jails” demonstrators and charged them with trespassing after they built a symbolic schoolhouse at the empty lot where the $100 million facility is to be built. But the other big target was the local news media, scrutinized and sidelined in a more-severe-than-usual way. “All the media, back behind the perimeter!” Baltimore City Police Detective Kevin Brown shouted to the gaggle of reporters and TV cameramen assembled for the confrontation. A 7 p.m. sweep-through by Brown a phalanx of police pushed the cameras and most reporters back hundreds of yards away, on the other side of Monument St., behind yellow tape. 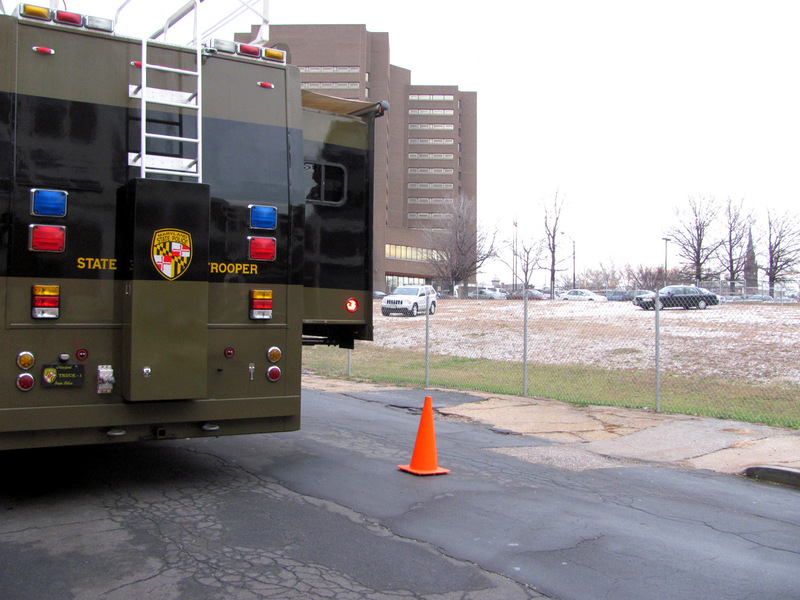 Once they were safely cordoned off to the south, the baton-wielding SWAT team moved in from the north. About two dozen of them closed in on the crowd of 20 protesters, standing beside the large green tent they had erected on Forrest Street, between Monument and Madison streets. 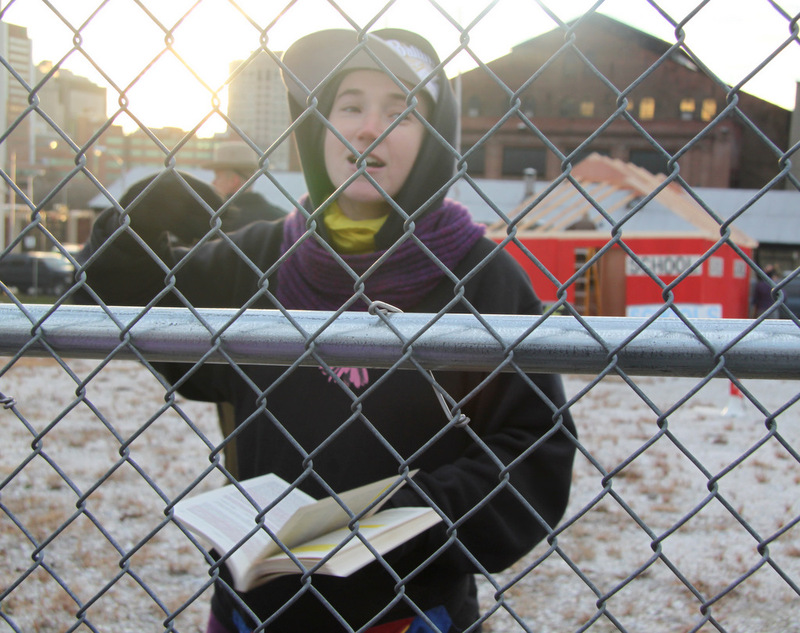 Just inside the chain link fence was the symbolic “Little Red Schoolhouse” that the six arrested protesters had erected hours earlier. 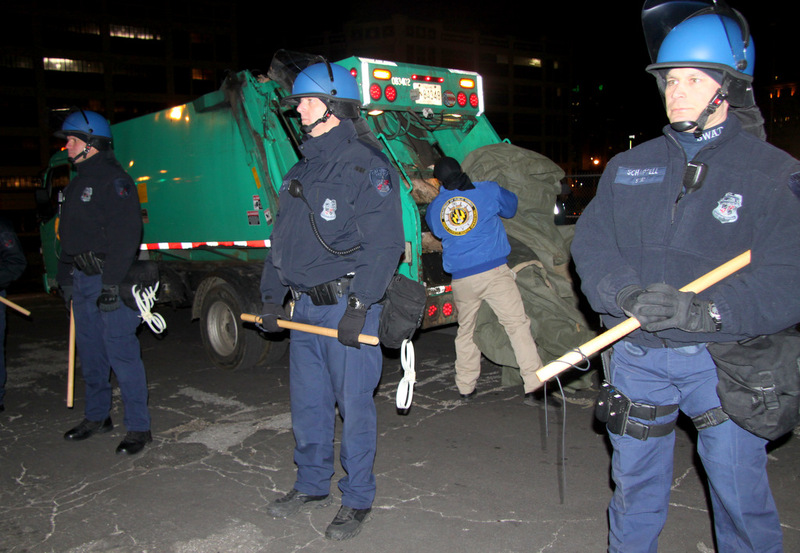 A green city garbage truck and a couple of public works employees were poised, as was a city ambulance. “Money for jobs and education! Not for mass incarceration!” the protesters chanted. Most, braced for arrest, had written their legal advisor’s number on their forearms with a green Sharpie. Steering clear of the press corral, The Brew remained amid these protesters and watched most of what happened. Here’s what we saw yesterday, and what happened to those two structures. 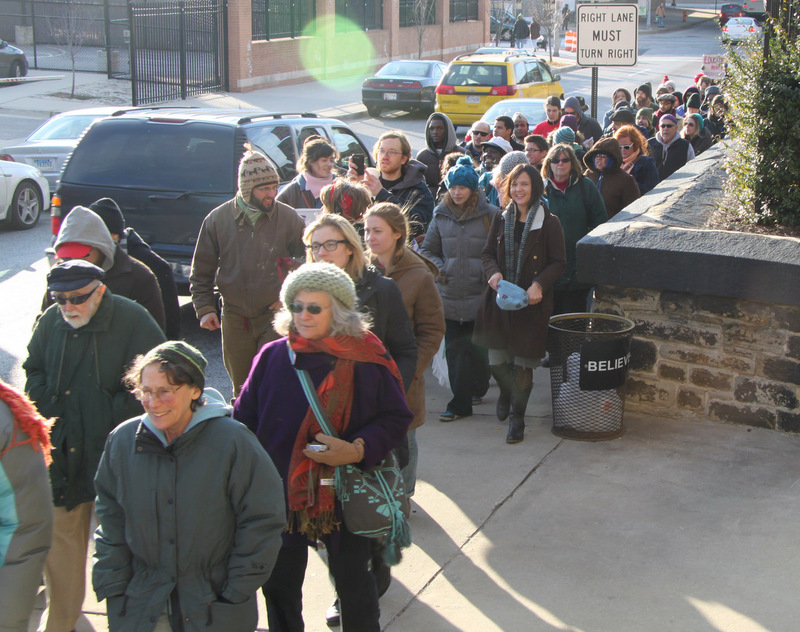 The day began with about 200 chanting protesters rallying in front of Central Booking on the Fallsway. 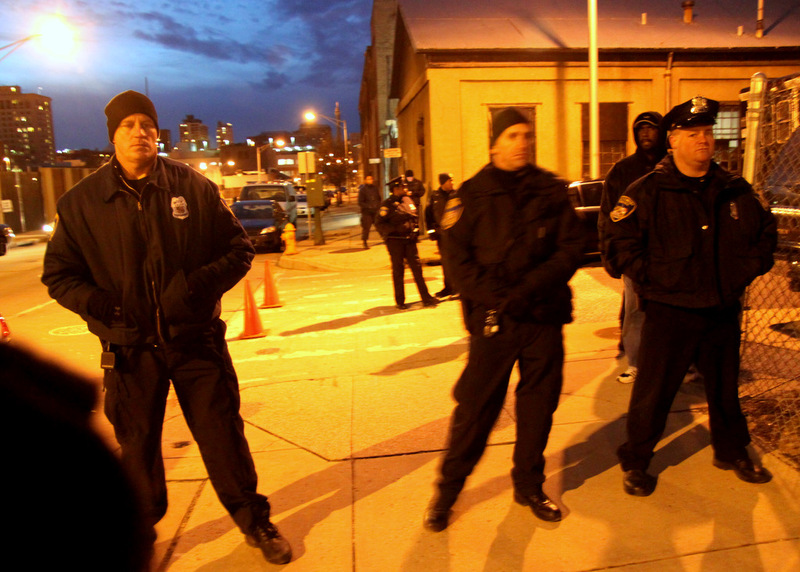 The organizers (the Baltimore Algebra Project, as well as people who had participated in Occupy Baltimore) intended the Martin Luther King Day action as the start of a five-day “pop-up” occupation. Mimicking the non-violent, civil disobedience protests staged by Dr. King and other black activists in the 1950s and 1960s, they planned to stay in a tent at the site of the proposed jail at 600 E. Monument St. They would serve breakfast, lunch and dinner, have speakers and teach-ins, talk to the media and call attention to their opposition to the planned 180-bed juvenile detention facility. In place of the detention center, the protesters have called for increased government spending on Baltimore’s city schools, especially physical improvements to its aging stock of buildings. They have also called for fully funding Baltimore’s youth recreation centers and held organizational meetings to oppose Mayor Stephanie Rawlings-Blake’s plan to turn some rec centers to private operators, or close them, as a budget-cutting move. Wendell France, Commissioner of the Division of Pretrial Detention and Services for the Department of Public Safety, told one of the participants yesterday, Kate Khatib, that protesters would not be allowed on detention center site. Rally speakers expanded on the point. “Since the 1970s, our public schools have gradually become more and more prison-like,” said Lester Spence, assistant professor of political science and Africana studies at Johns Hopkins University, addressing the crowd with a bullhorn. Members of the Algebra Project, a non-profit that advocates for public education funding and other issues, said high school students tell them they don’t want to commit the kind of crimes that land them in jail, but they have few choices. “’I don’t have a job,’ they say, ‘but I want a job. I’m on the corner but I don’t want to be,’” said Algebra Project youth organizer Maryland Shaw. Among the other notable audience members were venerable Jonah House peace activist Elizabeth McAlister, Algebra Project director Jay Gillen and Baltimore chapter head of the National Action Network, Marvin L. “Doc” Cheatham, who briefly spoke. 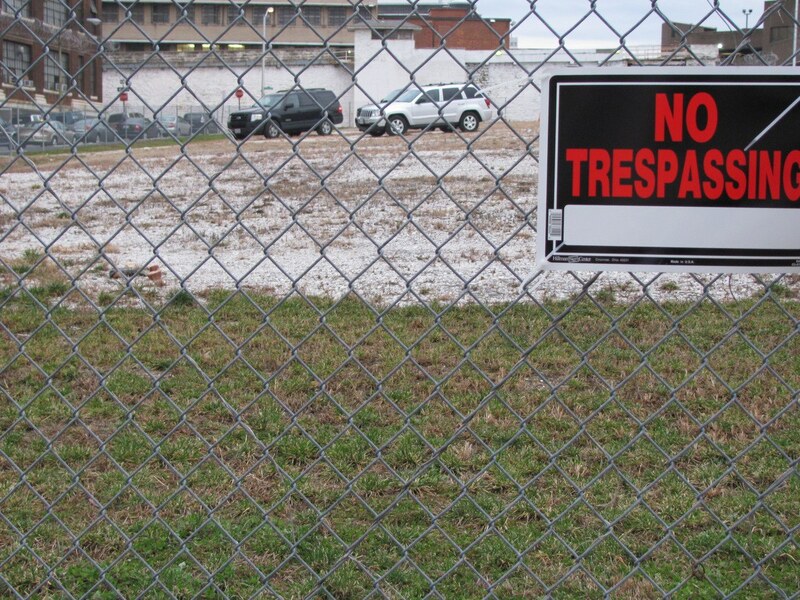 At the large vacant lot, protesters entered through a gap in the chain link fence. Pieces of the schoolhouse structure were rapidly handed over the top of the fence as police looked on. Out came boxes of nails, cordless drills, ladders. As Mike McGuire, Greg Hill, Nima Shahidi and Taimak Holland assembled the “school,” six or seven state troopers lined up just inside the fence, facing out to the rest of the crowd. 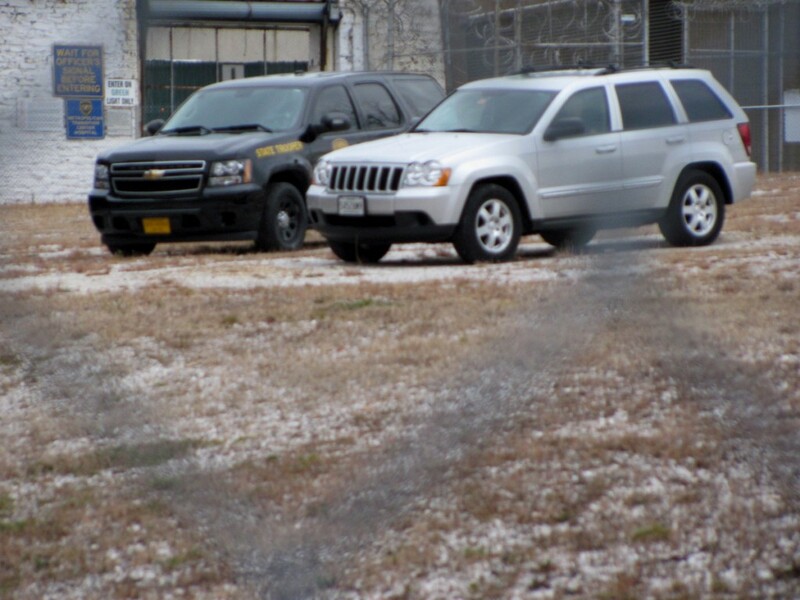 Two women, Anne Marie Rush and Iris Kirsch, an English teacher at Heritage High School in Lake Clifton, slipped in, as well, before police closed the gap in the fence with a chain and padlock. Kirsch led the crowd in a mic-check reading of an excerpt from the autobiography of former Maryland slave, Frederick Douglass. These were the six people police later carried off the site, as cell phone camcorders rolled and protesters chanted “Shame! Shame!” Khatib said the group’s legal counsel confirmed that they had been taken to Central Booking. “At 5:18 that tent has to come down,” the officer yelled. About two hours later, police cleared the TV cameras and marched in. They separating the crowd from the tent and finally pulled the tent down. It went into city trash trucks. “What’s with all the riot gear? We don’t see a riot here,” the group chanted. He warned that I’d be subject to the same treatment “they” were, indicating the protesters but declining to say what that treatment was. After I and many others left, they pulled the schoolhouse down. In the gray light of this morning (1/17), we took some shots of the grassy lot, now empty save for three State Police SUVs and one unmarked cruiser.